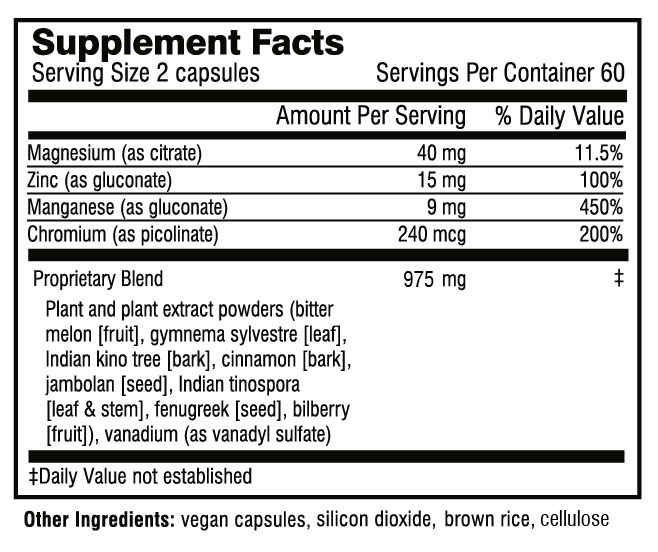 Take 1-2 capsules per day (upon rising and/or at bedtime), or as recommended by a health practitioner. Your body and brain depend on balanced levels of blood sugar (glucose) to steadily supply your cells with fuel for energy. Stress normally drives blood sugar up to power a “fight or flight” physical response via the adrenal stress hormone cortisol. Cortisol converts energy stored in your body into glucose so that your blood sugar rises to energize that anticipated surge in activity. As your blood sugar goes up, insulin is secreted by your pancreas to move the glucose from your blood into your cells. This extra glucose is meant to be used up by a strenuous physical response to the stress, which restores blood sugar back to normal. In the prehistoric world, stress typically came from physical threats against which a short burst of activity increased the odds of survival. However, in the modern world stressors are typically ongoing pressures against which physical activity is seldom used or useful. If your life is stressful, especially with a diet high in refined carbohydrates and without regular vigorous exercise, the consequent repeated or chronic blood sugar and insulin elevation you experience can create problems over time that prehistoric humans probably never had to face. When this is occurs too frequently, your cells become more resistant to insulin to avoid the toxicity of excess glucose. This can leave too much glucose in your blood and too little in your cells. To maintain balance, your body converts and stores the excess blood sugar as fat – usually around your abdomen. Paradoxically the decreased amount of glucose getting into your cells triggers hunger and you may find yourself craving carbohydrates. Refined carbohydrate consumption spikes your blood sugar up and the vicious cycle of blood sugar imbalance and insulin resistance continues – an added stress with ever greater negative consequences for your whole body over time. When it comes to blood sugar, maintaining balance is the key for good health and steady energy. What is Dr. Wilson’s Good Sugar? What does Dr. Wilson’s Good Sugar do? Does Dr. Wilson’s Good Sugar contain sugar? Will Dr. Wilson’s Good Sugar raise my blood sugar? Will Dr. Wilson’s Good Sugar give me energy? 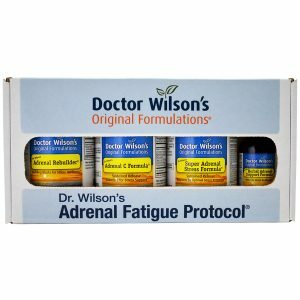 Does Dr. Wilson’s Good Sugar contain natural or synthetic stimulants? Does Dr. Wilson’s Good Sugar contain hormones or steroids? Who can take Dr. Wilson’s Good Sugar? Can people with diabetes or metabolic syndrome use Dr. Wilson’s Good Sugar? How quickly will Dr. Wilson’s Good Sugar begin to work? How should I take Dr. Wilson’s Good Sugar? How long can I take Dr. Wilson’s Good Sugar? Can I take too much Dr. Wilson’s Good Sugar? Can I do anything else to help my blood sugar? Is the quality of Dr. Wilson’s Good Sugar reliable? 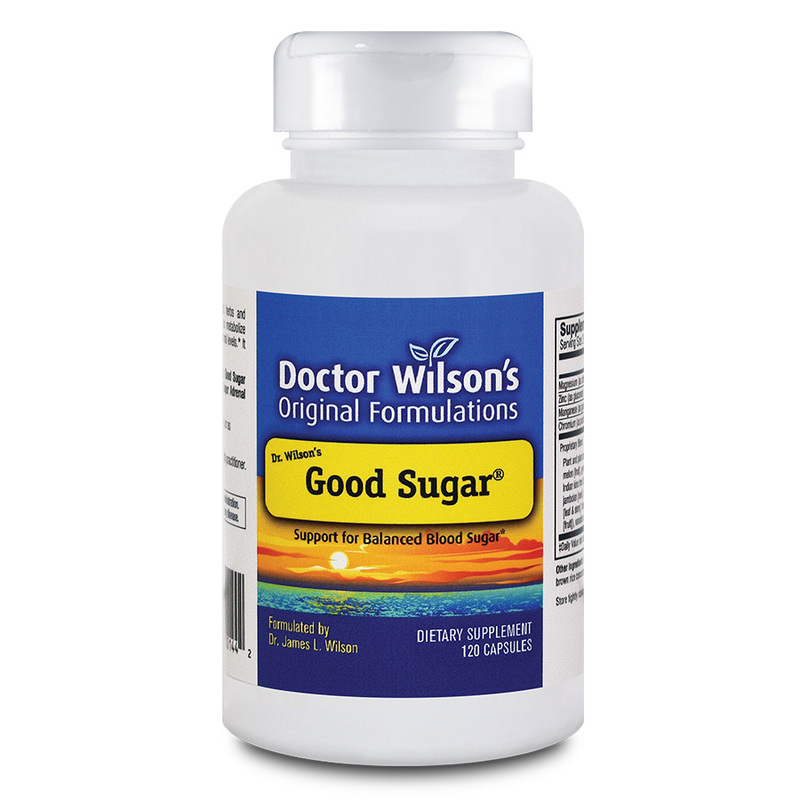 Can people with diabetes or metabolic syndrome take Dr. Wilson’s Good Sugar? How long should I take Dr. Wilson’s Good Sugar? Can I do anything else to help my blood sugar balance? I had been doing great on the Adrenal Program and decided to add Good Sugar and Thyro-Balance to the mix. It was amazing. 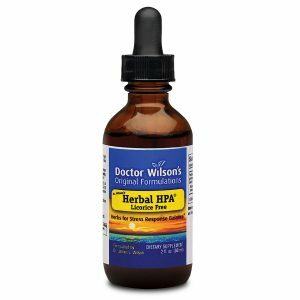 I’m just so thankful to have Dr. Wilson’s products – I was miserable for years and this just changed everything!